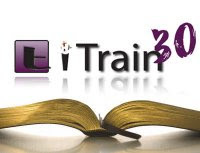 Welcome to iTrain30. A thirty day church wide effort to establish the discipline of a “quiet time”. I suggest that you begin with prayer. Thank God for 5 things. In your prayer tell God that you want to spend time with Him in prayer and in reading scripture. Read the passage and meditate on what you have just read. Respond in prayer to your reading. Admit areas of your life you need to correct and ask for help to change. Focus on that throughout the day. The psalms are great to personalize and turn into a prayer. Proverbs provide some thought provoking statements to ponder. While it is good to have questions, be sure you focus more on what you did understand than your questions. Share something in the comments. End your time with prayer for others and yourself. Let’s begin. I am praying Phil. 1:9-11 for myself: that I may grow in love, have discernment and would be filled with the fruit of righteousness. When I read Philippians 1:3-4 I am reminded of our six moves throughout the years and I can't help but think of all the Christian friends we made in those six communities. While we may not keep in touch with all, I still know they are "carrying it (good work) on to completion..." and I "always pray with joy because of our partnership in the gospel...". So comforting to know there are others who know and are spreading the truth. Thanks, pastor, for this communication. As we continue to study God's Truth and as Proverbs 1 stated to know wisdom and instruction, to perceive the words of understanding our hearts and lives will be growing for the people who need Jesus Christ. We as believers need to be like the tree by the river in Psalms; so that we can grow and be weak everyday, but stronger in God. What appropriate scripture to begin the iTrain 30. Not only does it provide hope and encouragement for the individual, but Paul's letter to the Philippians also sets forth godly guidelines for the church...share together, love each other, grow together. I am humbled daily by God's perfect provision and guidance for our lives. Thanks so much for doing this, Pastor. I am always more faithful in my daily quiet time when I have other to hold me accountable. Psalms 1 is a favorite for me, too. (It seems that I when I don't know where to read, I go back to the Psalms.) I love the picture of being a tree planted by the river. If we are to stay rooted in our God, we will not wither, but be prosperous in all that we do and will bear much fruit. This stood out to me. Phil. 1:6 being confident of this that he who began a good work in you will carry it on to completion until the day of Christ Jesus.That verse stands out to me because it give me hope that he has a plan for my life and that he will carry on his plan until he comes back! After reading teh passages there was something that came to mind. To know wisdom and instruction you must first understand. It is one thing to hear, it is another to understand. A student may be in a classroom and hear and may even be able to give the teacher back the answers he/she is looking for, but do they really understand? For me this stressed the importance of having people who we can go to when we don't understand.